Despite brill online face-to-face services like iTalki for practising and learning languages with native speakers, you can’t beat time spent in the country as the best way to immerse yourself in your chosen language. Seems like an expensive way to fluency, doesn’t it? But it doesn’t have to be, with a range of web tools for sourcing super-cheap travel to your target language country. 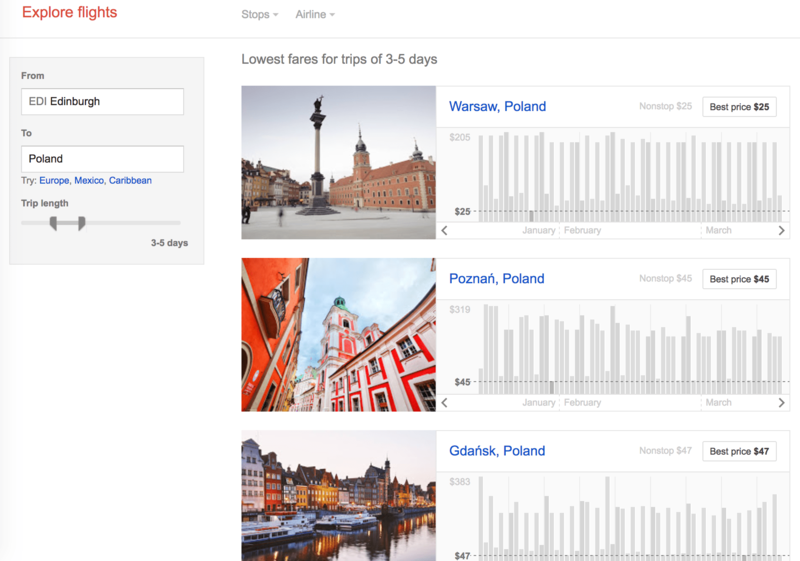 Top of the list, and indispensable to the travelling linguist, is Google Flights Explore. It’s not particularly well signposted online – in fact, it’s practically clandestine, and you have to be told by someone else ‘in the know’ before you can find it! Why the experimental extension to Google’s flight search is not promoted more is a mystery, but it’s second-to-none at sourcing cheap flight offers with very general search terms (and I mean very – you can pop in ‘Scandinavia’ or ‘Eastern Europe’, and it will check the lot!). For instance, say you’re learning Polish. Enter your preferred airport of origin, then Poland as the destination. You can adjust the length of the trip if you like, but the default 3-5 days is a good short break duration if you’re looking for a cheap getaway to practise your language skills. You don’t even need to add a date, as when you select your start and end points, you’ll be presented with a list of destinations along with time charts of the cheapest flights to each. It will even order them, with the cheapest, on average, at the top. The example below shows that I can get to Warsaw from Edinburgh for as little as around £20 return (USD$25, although prices in your local currency appear when you click through to one of the flights on the time chart). Switching to a traditionally more expensive flight destination, such as Norway, still yields great results; a quick search today threw out some £30 returns on London-Oslo routes. It’s just as handy for longer-haul flights, too; flying from New York, Norwegian students can get to the country for under USD$300 return in a sample search made at the time of writing. But how to minimise costs when you get there? Accommodation will be perhaps the biggest expense on the tick-list. It’s no big secret that, for value, you can’t really beat private rental services like AirBnB. Combining with the sample Polish flight search above, you could add a private room in a shared house for just £11 a night at the time of writing. That amounts to less than £100 for a 5-night stay, flights and accommodation included. Compare that to the often sterile, internationalised hotel reception experience, and private accommodation offers big boons for the language traveller! There are ways to minimise living costs while you’re there, too. They may not be glamorous – buying food supplies at supermarkets rather than going out to eat, grabbing a cheap pølser i brød (hotdog) at an Oslo kiosk for tea – but again, they bring you into direct contact with the target language, rather than sanitising your experience through safe, familiar settings like restaurants. It might seem an extreme measure – and, intuitively, an outrageously unaffordable one – to ‘pop abroad’ when you need some target language practice. But it needn’t be bank-breaking, if you know where to look. Commit to a cheap cultural scouting trip once every month, or at least couple of months, setting yourself a tiny budget and seeing what you can do with it. Your inner linguist will thank you!